So our floor has been papered with poems this weekend to help me finalise my first solo collection to be submitted to a publisher. Good job the husband’s away! Using some of the exercises in Pascale Petit’s Towards a Collection course booklet, I have never had so much fun with my work. And such an intense experience! 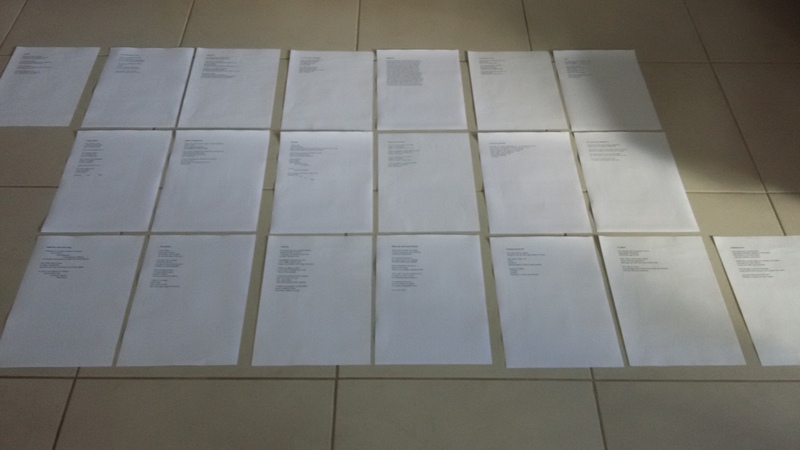 Deciding which poems to include didn’t actually take too long. What took time was deciding the order of them. So onto hands and knees I went to arrange them all around me, and I know this sounds weird but pretty soon they were talking to each other. And connections were made and a kind of pattern emerged, almost organically, when I considered form, shape, length, perspective and content. I wanted poems to compliment each other as well as producing contrasts, and alongside the overall theme others emerged, images echoed and after reading it all through in one sitting I felt quite emotional – as all the characters and feelings from each piece met for the first time in my head. Following Pascale’s advice, I started the collection with a few strong poems to pull the reader in and closed using the same technique because let’s face it, we do all have our favourites in our work. And I must admit I’m very pleased and excited by the final product. Fingers crossed the publisher is too! Great work JVB. Good luck with the submission. One day I’ll get around to it …. maybe.